Well priced, well made. Perfect fit. Laura Ashley Crochet accessories are the perfect accent to any bedroom. 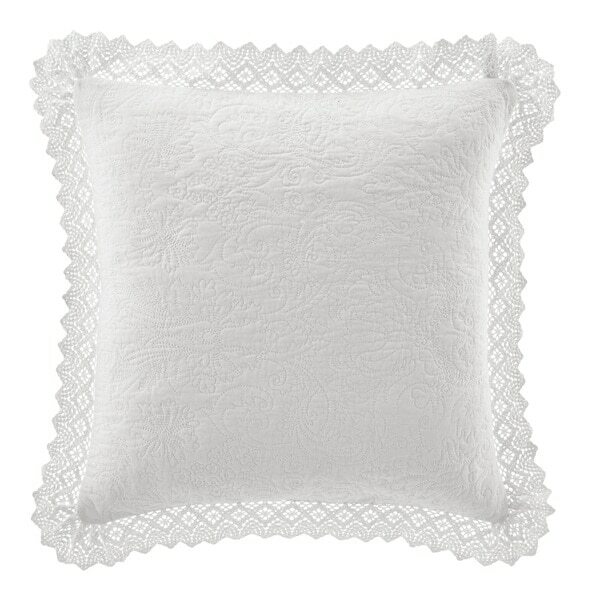 This decorative pillow is 100% cotton and features delicate crochet lace edges. Machine washable, feature envelope closure. Layer into your bedding collections to update the look. The pillow features allover damask embroidery and are classic Laura Ashley designs. Pillow measures 16x16 inches. Great quality white textured pillow. Goes perfectly with my green and white Laura Ashley coverlet and shams! Highly recommend it to complete your bedding set. This crochet decorative pillow matched my beds euro shams perfectly. Love the Laura Ashley line of bedding that I bought. Everything matched perfectly. Looks elegant and feels elegant. Sent it back because the color did not match well with the Laura Ashley Harper bedding set. Pretty pillow. This is a beautiful accent to the bed. The finishes and materials are very good quality. I definitely recommend this pillow to complete your quilt set. Very well made ckean white pillow. It’s just sweet and solid! I was very happy with it and the price was great as well! It’s a nice accent piece! I bought these pillows for my living room sofa. I wanted something to brighten it up. They are a really nice size and the crocheted boarder is so pretty. You will really love them! The quilted body of the pillow is nice, but the lace around the pillow is yellowed. Perfectly matches the Laura Ashley Heirloom quilt. Very happy with purchase. Beautiful little pillow, well made. The whole set is gorgeous!!!! Hopefully it'll match the bedding set I ordered.